Beniimo Tart is one of the most popular sweets visitors to Okinawa like to buy for “omiyage” presents to give to friends and colleagues when they return home. The tart is made of Beniimo, the sweet potato that was introduced to Japan in the early 17th century from China through Okinawa, and to this day is a specialty of the prefecture. 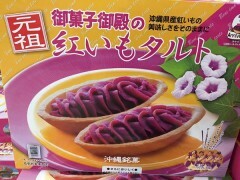 Not only people outside of Okinawa appreciate the purple sweet, it also has many fans among residents. People of all ages love it because its thick natural sweetness and plain simple taste.